The prospects for universal health care in the United States appear unusually bleak these days. Just as the first U.S. state -- Vermont -- was getting ready to implement a universal, publicly financed health care system, its governor pulled the plug on his support. Years of studies, preparations and proposals, a mountain of supportive data and a clear legal mandate fell by the wayside as soon as Governor Shumlin felt that the political stars were no longer aligned. Meanwhile, in Washington DC, even the Affordable Care Act's approach of making private health insurance more affordable by subsidizing over-priced insurance products is under attack in the Supreme Court. Why is universal health care, which is commonplace around the world, so hard to achieve in the United States? Why are we unable to overcome a market-based system that leads to a hundred thousand unnecessary deaths each year? Corporate interests in maintaining this system are powerful, as is a culture of competition and consumption that sees health as a personal choice rather than a human right. The odds against universal health care advocates are long: What does it take to turn a market commodity into a public good, and dismantle an entire industry along the way? For the past few years, as the limitations of the Affordable Care Act were becoming increasingly clear, a mass people's movement in the small state of Vermont paved the way for universal health care, winning the passage of a 2011 law that mandated the state to financed its health system publicly and equitably and guarantee access to care for all. Yet as the governor's recent about-face illustrates, the task at hand remains challenging. It is not a new task, as Dr. Martin Luther King Jr.'s 1967 speech, "America's Chief Moral Dilemma," reminds us: "It didn't cost the nation anything to integrate lunch counters; no expenses were involved; no taxes were involved. [...] Now we are dealing with issues that will cost the nation something in terms of billions of dollars. [...] We are now dealing with issues that will demand a radical redistribution of economic and political power." Dr. King was envisioning ending poverty and ensuring economic and social rights for all, including people of color who were -- and still are -- most affected by economic injustice, and he predicted strong resistance from the powers that be. Half a century later, progress toward this vision has been halting at best, and resistance is enduring to this day. The country is currently experiencing the largest concentration of wealth since the 1930s and the biggest income inequality gap since the late 1970s, with inequitable financing of health care directly contributing to this injustice. In the private health insurance system, low-income people pay proportionally more for health care than the wealthy, while receiving lower value insurance plans. One in three people in the U.S. struggle with medical bills, while insurance executives are raking in billion-dollar compensation packets. This inequitable market-based system -- with its different and unequal insurance products, different and unequal prices for health services, and different and unequal access to doctors -- is both unjust and unsustainable. Public, tax-based financing of health care would take an important step toward realizing Dr. King's vision by ensuring both universal access to care and equity in the payment for care. Moreover, it could free up resources for other public services, since universal health care is about sharing costs more equitably, not raising new money. To situate this in Dr. King's frame, radical health care reform is about economic redistribution through taxes, not about raising extra billions of dollars. Vermont's movement for the human right to health care has produced new evidence for this. 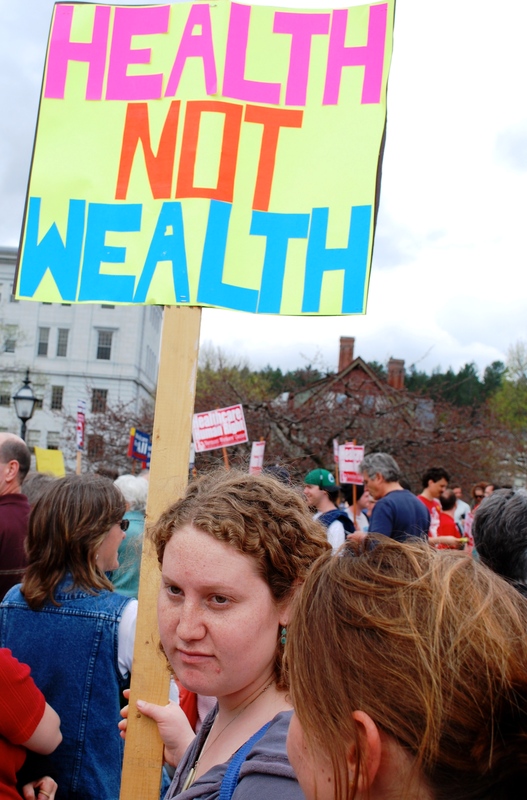 Governor Shumlin's own proposal for public financing showed that 9 out of 10 families would see their incomes increase if the state moved to universal health care, with only the wealthiest facing a decrease, while the system overall would generate substantial savings. Yet the governor's plan tanked because his business tax proposal was inequitable: small businesses were charged the same flat tax rate as large companies, making it a non-starter for the state's over 75 percent of businesses with fewer than 10 workers. That is why Vermont's Healthcare Is a Human Right Campaign recently prepared its own equitable financing plan, using the governor's data as a baseline but adding new revenue designs. At the core of this plan is an innovative, progressive business tax that takes into account company size as well as wage disparity. Tax obligations would be lower for small businesses and for those with low wage gaps between the top 1 percent and bottom 50 percent of wage earners. This would ensure not only that businesses pay based on their ability, but also incentivize them to raise rather than lower wages for the majority of workers. Other revenue sources modeled in the Campaign's plan include a progressive income tax and a tax on the capital gains, stocks, and financial transactions of the wealthiest 1 percent. This plan, published by the Vermont Workers' Center and the National Economic and Social Rights Initiative, shows that public health care financing at state level is not only financially and economically feasible but essential for paving the way toward a more equitable society. By moving from private, market-based insurance to public financing of universal care, we flip the way we pay for care, so that low- and middle-income people pay a smaller share of their income on health care than the wealthy -- the opposite of the current system. The Healthcare Is a Human Right Campaign's financing plan was delivered to Vermont legislators along with an open letter from over 100 economists from across the country. "As economists," the letter reads, "we understand that universal, publicly financed health care is not only economically feasible but highly preferable to a fragmented market-based insurance system. Health care is not a service that follows standard market rules; it should be provided as a public good." The letter concludes with a call for action: "We support publicly and equitably financed health care at federal and state level, and we encourage the government of the state of Vermont to move forward with implementing a public financing plan for the universal health care system envisioned by state law." It will take more than 100 economists and a sound financing plan to bring universal health care to the United States. Yet the people's movement for our right to health, both in the form of Healthcare Is a Human Right campaigns in Vermont, Maine, Maryland, Oregon, Pennsylvania and Washington, and in vibrant variations in many other states, is continuing the struggle, guided by Dr. King's reminder that "the arc of the moral universe is long, but it bends towards justice." Politics News Health Care Income Inequality Single Payer Martin Luther King Jr.